●Competition Period: Of today. Welcome to share your works. ●Competition Aim: Would you want to cast the rod? 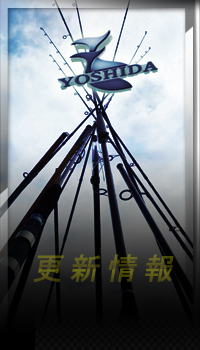 Call your friend and follow YOSHIDA SEIKO. Get rid of your worry and let’s go to fishing together. YOSHIDA SEIKOholds this competition for essays and pictures to reward members. Let’s work together on this great project. 3. Contents: Contents are what you learned after fishing. The words of essay need to be over 300 and the pictures linked with the content are better. 7. The works must be made originally. No copy, reproduction or anything will violate Intellectual Property Rights from others. If founded, the qualification will be canceled. 9. If the above requirements don’t be met, the works won’t be under election. 1. Keys of Election: We will elect the works by the link between essay and pictures, uniqueness and abundance. The words of work must be over 300. Please download the form which is titled YOSHIDA SEIKOEssay-Writing Competition from “Members”. Please email you work with the title “Yoshida Essay-Writing Competition-your member number-your subject”. 2. Time of election: We’ll reply in one month after receiving your works. 4. Notifying: If your works are elected, we’ll notify you with email and phone call and send the prize after contact. 5. DISCLAIMER OF WARRANTIES: The works are offered by the competitors voluntarily and competitors should take responsibility for their works. If the works cause the legal dispute, we are disclaiming. YOSHIDA SEIKOreserves the right of explanation and the right of use for the works to this Essay-Writing Competition for members.